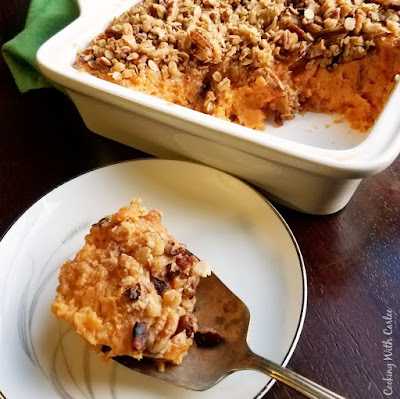 This Maple Crunch Sweet Potato Casserole is a smooth maple kissed filling topped with a perfectly crumbly and filled with oats and pecans. Your holiday table won't be complete without it! Fall and winter holidays call for sweet potatoes. They are definitely a Thanksgiving staple but also go well with a Christmas ham. Come to think of it, they're delicious with an Easter ham or just because it's dinner time pork roast as well! Our family always has the debate between whether to serve the sweet potatoes with marshmallows like my baby sister wants or the kind with the pecans like my grandpa wants. So we normally do the sensible thing and have both! 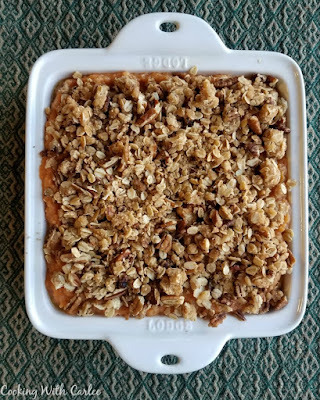 Last year I was in charge of the sweet potato casserole for the big family Thanksgiving. MiMi made the kind with marshmallows. Of course I couldn't just follow a recipe. I wanted it to be different. So I added maple syrup instead of sugar to give those warm maple notes. Then I added oats to the topping. The results were phenomenal! There are usually two to three dozen people, so the recipe I made filled a lasagna pan. I couldn't wait to make it again this year, but we had a much smaller gathering. Plus only a couple of us normally eat the sweet potatoes. So I scaled back the recipe and adjusted the filling to topping ratio a bit, because more topping never hurt a thing! I must say the results were scrumptious. How does your family eat sweet potatoes at holidays? Do you have a debate over how to fix them? Drain the sweet potatoes really well. Place in a large bowl and mash until smooth. Stir in the maple syrup, salt, vanilla, eggs, and butter until well combined. Pour into prepared baking dish and smooth the top. In a small bowl, mix together the topping ingredients and sprinkle over the top of the sweet potatoes. Just love the addition of the oats to the topping! Looks scrumptious! I hope your week gets of to a great start pretty lady! It makes it feel a little healthier too! ;-) Thanks, Andrea! Never had sweet potato like that.. This looks amazing and delicious! The scrumptious nutty crunchy topping on top is wonderful! We serve it as a side, but it tastes like a dessert ;-) It's so good! Thanks, Deepika! Looks so yummy and maple sounds fantastic! Pinned! Thank you for sharing on Merry Monday! Hope to see ya next week! I love adding maple syrup to just about anything! Thank you! Hi Carlee, there is no such thing as too much topping! Especially when it contains oats! I do like sweet potatoes althought the family aren't too keen ( I can sneak them in though). Now this casserole sounds good enough to be a dessert, I can see how it's sweetness would add to a Christmas table. That looks fabulous! I love lots and lots of crunchy bits on top of my sweet potatoes! 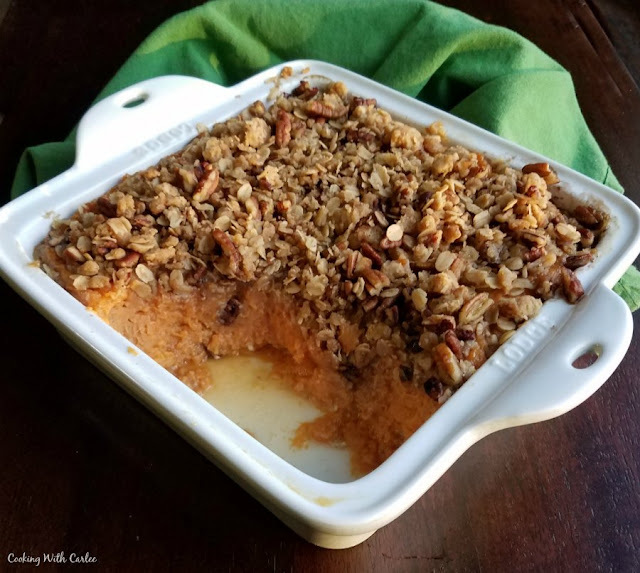 Your Maple Crunch Sweet Potato Casserole will be a great side dish for any holiday table! Hope you have a great week and thanks so much for the party!